If you find the term "grower" misleading, then, believe that the very phrase "dog breeding factory" is only an informal term, recently used widely in connection with the illegal sale of pets. How is this a "breeding factory" really and what you can currently do with this phenomenon? We can say that the Czechs are a passionate breeders of dogs and cats. Dog or cat can be found in every fourth household. Breeding and selling dogs for profit is, however recently viewed very negatively, because an increasing number of cases where breeders - "breeders" and traders selling animals too young, under-wormed, or even sick. The category "množíren" can include registered breeds on the one hand, firms or legally trading with dogs, as well as non-registered breeds with uncontrolled production of puppies for sale and not the least problematic unrecorded breeding puppies with uncontrolled production, where farmers growing steadily due to the number of animals declared love for animals, respectively. their salvation. The Czech Republic is legally treated livestock for the purposes of trade law on the protection of animals against cruelty. That means that anyone who trades with animals (whether they are puppies or exotic animals) and properly filed with the Trade Office and the regional health administration gets under veterinary supervision. However, if the breeder does not address these responsibilities assigned, then "escape responsibility" both in terms of finance and health, which is currently supported by a social system based on the free dissemination of information through the Internet and the free movement of persons and goods within countries and across the EU (Schengen area ). In summary - ideal breeder meets the legal requirements for registration of a trade and also looking to make animals of the breed grew up in a suitable environment was healthy and socialized, if possible. So if you want to buy a puppy to an advertisement of the consent of the handover to the gas station or the train station. Go have a look at the breeding of puppies and the mother, calmly talk to the breeder about the temperament characteristics of parents about the health problems that can be expected in the breed. On the Internet, you can also compare the price in advance, for what they sell "paper" and "non paper" animals. You will often be surprised. 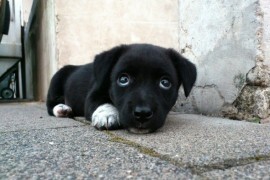 When buying a puppy, ask the vaccination card, where all vaccinations confirmed by a veterinarian and proof of worming. And do not forget the interiors with new home puppy familiar with his veterinarian who inspected it and possibly make the necessary preventive actions.